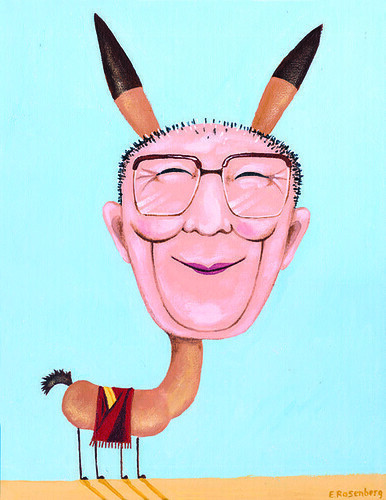 "THE DALI LLAMA RIDES AGAIN" is a special fast fiction written to celebrate the Dali Lama's ninety-fifth birthday !! Someday it will be the Dali Lama's ninety-fifth birthday and I hope this humble little story will be used to celebrate his holiness. And I hope someday somebody shows him this very cute image made by the lovely and talented, Eleanor Rosenberg,who you can contact if you are interested in helping out with words or images for a book that she's putting together for an Emily Carr grad project. On the topic of the Dali Lama, I'd also like to direct you to a friend of mine who's currently traveling through Tibet. Visit his detailed travel blog-o-rama to find out the latest fashions in Tibetan Buddhism for the fall season. "Hey Dali, what's up ?" A young monk gives the Dali some skin and their fingers snap in unison. "Ahh, you know just... I don't think it really went as I'd hoped. I mean everything was in place but the whole shebang just didn't jive." The Dali looks out his hotel window and stares at the shimmering lights of the city. "I mean I don't even know what city I'm in. Oh wait, I do know, Hey Chicago are you ready for some enlightenment ? Yeah that's right, Chicago." "But that poster behind you of your head on a llama was choice. Funny stuff. I mean what's not to like and those activity books for the kids... Where's His Holiness ? and your head on the llama body somewhere in the crowd. People eat that stuff up." "Yeah but do they really get it?" His eyes are shielded by his tinted sunglasses but a tear trickles down into the open. It's midway through the tour and the Dali needs to cut loose and let off some steam in the city. The Dali needs to get schloshed.